From Goodreads ~ Emma would give anything to talk to her mother one last time. Tell her about her slipping grades, her anger with her stepfather, and the boy with the bad reputation who might be the only one Emma can be herself with. But she can’t tell her mother anything. Because her mother is brain-dead, being kept alive by machines for the baby growing inside her. Meeting bad-boy Caleb Harrison wouldn’t have interested Old Emma. But New Emma – the one who exists in a fog of grief, who no longer cares about school, whose only social outlet is her best friend Olivia – is startled by the connection she and Caleb forge. Feeling her own heart beat again wakes Emma from the grief that has grayed her existence. Is there hope for life after death-and maybe, for love? I think it’s important to note that I like sad books. I regularly seek out stories that I know will make me miserable. Give me angst over humor any day of the week. (What does this say about me? I don’t even know…) Anyway, it’s no surprise that Heartbeat appealed to me immediately. There are the mentions of grief, the hints at regret, and, of course, the reference to love. Total Katy Book. 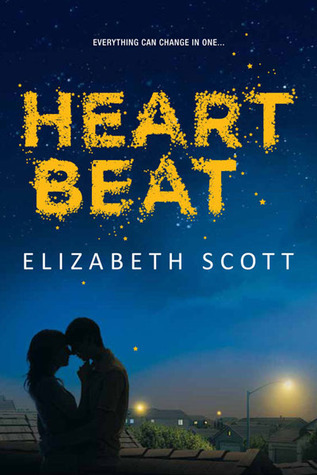 From what I’ve read in various other reviews, there are people who had a hard time connecting with Heartbeat‘s protagonist, Emma. Yeah… I don’t really get that. I admit that Emma can be selfish and indignant and kind of a jerk, BUT. She’s only just lost her mother, the most important person in her whole world. Emma’s mother is gone, officially brain dead, but she’s being kept alive by machines, an incubator for the fetus she tried to conceive for years. The fetus her daughter thinks may have played a part in her death. Wouldn’t it be strange if Emma didn’t act out? Wouldn’t it be odd if she continued to work hard at school? Wouldn’t you question this seventeen-year-old girl if she handled death with nothing but grace and composure? I adore Emma. Yes, she’s confused and she’s misdirecting her anger all over the place, but she’s also incredibly compassionate and fiercely loyal. There’s a scene that involves her, Caleb, and Caleb’s parents and oh my gosh… I just love it so much. It made me want to stand up and cheer. It made me want to hug Emma, and Caleb, and it endeared me to them both so completely. And then there’s this other scene toward the end of the novel, once that involves Emma and her stepfather (now guardian) Dan, and it’s raw and beautiful and just bursting with emotion. If I was a Book Crier, I would have been a blubbering mess. Other things I loved about Heartbeat: Emma’s genuine relationship with Olivia, her best friend. Also, Emma’s developing romance with Caleb the car thief — so sweet and real and butterfly-inducing. And finally, Elizabeth Scott’s amazing writing and absolutely enviable teen voice. Oh, and the scene where Emma finds a bottle of strawberry wine… Brilliance. Read this one. You won’t regret it! Thanks, Sarah, and I totally agree. I’ve written a few struggling/grieving female protags and I’ve always sort of hated that “unlikeable” feedback. I think REAL is so much more important than LIKEABLE, and that’s what Elizabeth Scott did so beautifully with this book. So yep. Buying this as soon as I’m home from my business trip! This sounds like a book I’m going to LOVE!!!! Thanks for the review, Katy! I think you will, Elodie! It’s incredibly well done. Hope you have a safe and productive business trip! Great review Katy. I must admit I was on the fence about buying it. I adore Elizabeth Scott, but wasn’t sure if I’d find the subject matter too upsetting. I’ll definitely be picking it up now though. There’s a podcast called Clear Eyes, FullShelves that did a great interview with Elizabeth Scott. It’s really worth a listen. She says in it how surprised she was that people disliked Emma because she’s angry. She’s angry because she’s grieving! It really frustrates me that girls are meant to be nice, no matter what, give me real over nice any day. “Give me real over nice any day.” <— Yes! This is totally how I feel too. If Emma had acted cheerful and mature after her mother's death, people would have criticized her for being a disingenuous character (and she would have been really boring!). I will definitely listen to that podcast, Alexa. Thanks for the heads up! Give me angst, too! I love it when a book makes me feel all the feels. Thanks for the review, I’ll have to bump this one up on my list. It’ll definitely give you all the feels, Jennifer. Let me know what you think!